Amazing-looking vintage wall clock made from used vinyl records. Detailed information about the product: We may change a clock dial for you for no additional charges Clock movement works quiet and your favorite clock will serve you for a very long time The size our the clock is 12" We pack our handmade clock in a separate protected box . You can choose one of the templates developed by our professional designers or you can create your own design and we will implement it for you. The vintage vinyl record clock will suit to any design and interior. Order one for yourself and enjoy the words of delight from your friends, colleagues and neighbors. We will need around 2-3 working days to make you vinyl record wall clock and send it to you. Then it takes around 7-11 working days to be delivered to you. Tracking number is provided. We will refund you the money or send you another clock free of charge within 30 days after you receive the clock in case the clock comes broken. Please provide pictures. Your little piece of art is waiting for you. Don't doubt! MAKE A PERFECT PRESENT - Wanna make a unique and original gift but only named cup is on your mind? 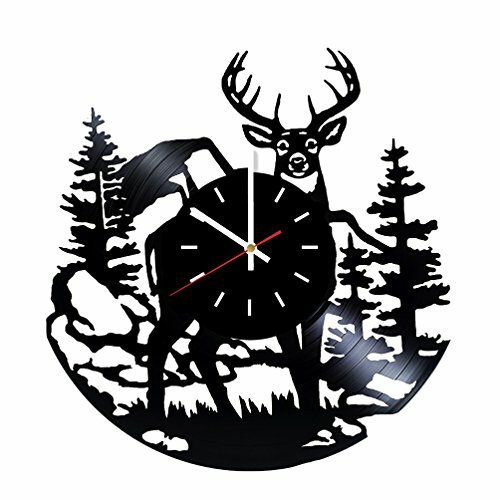 Impress everybody with handmade vinyl record clock! UNIQUE COMBINE OF MODERN ART AND VINTAGE STYLE - Vinyl Record Wall Clock is a perfect home decoration and will suit any design and interior! GET A UNIQUE HOME ACCESSORY! Be sure your friends and neighbors never remain indifferent after they have seen your modern vinyl record wall clock! PERFECT GIFT FOR ANY OCCASION: Anniversary, New Year or World Post Day... Or don't wait for any special days and make your today better with vintage unique clock!